Plain, boring text is out. Visual content is in. The attention span of the average adult is no more than a couple of minutes. A study from Microsoft discovered people lose concentration after only eight seconds—that’s one second faster than a goldfish. Jump to the Emoji Marketing Infographic. The human brain is wired to understand images; we process visual information 60,000 times faster than text. When it came to getting your message out during the Internet’s early days, the written word was the best method. But today we receive five times as much information as we did 30 years ago. As of 2009, it was estimated we consume 34 gigabytes of information or 100,500 words, outside of work on an average day. That number has undoubtedly spiked since, and almost every major social network has used this data to increase the prominence and importance of visual content. Today 63% of social media is made up of images. This has opened up a number of creative opportunities for marketers. One of the biggest visual trends to take the marketing world by storm is emoji. Chances are you’ve already seen your fair share of emojis littering social feeds and text messages. But just in case you’re not quite sure what we’re talking about, we’ll officially introduce you to the visual world of the emoji and explain what makes them a perfect fit for marketing campaigns. Emojis, created in the 1990’s by a Japanese communications firm, evolved from typographic displays of facial representations or emoticons. These small, digital images or icons are used to express an idea or emotion in electronic communication. In America, Apple helped bring emojis mainstream when it added the emoji keyboard to iOS 5 in 2011. Since then, digital language has evolved and now nearly half of comments and captions on platforms like Instagram contain emoji characters. Today, 1,620 emojis are supported in iOS 9.1. The word emoji, which literally means “picture character,” was added to the Oxford Dictionaries in 2013, and eventually crowned the Top Word of 2014 by the Global Language Monitor. This marked the first time a symbol was chosen. 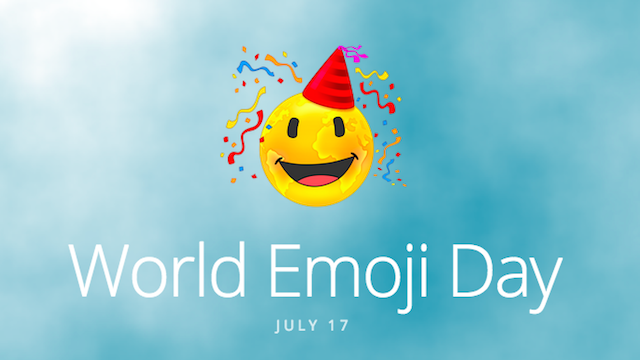 The language is even celebrated every July 17th on World Emoji Day. 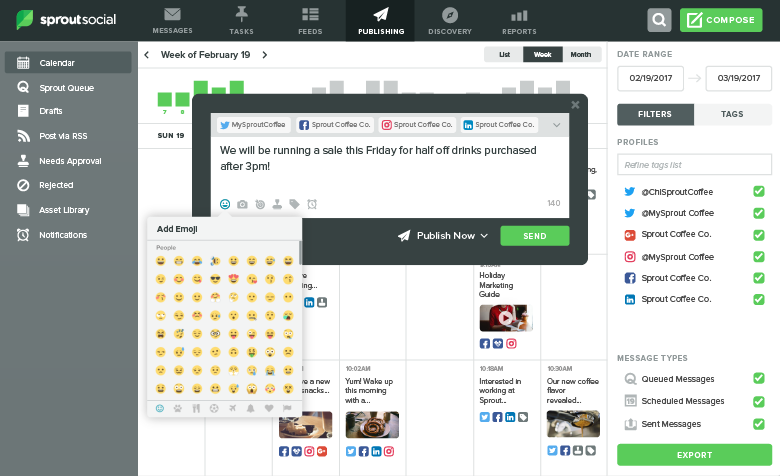 And now within Sprout Social’s publishing suite, we offer emojis directly in our compose box! Try Sprout Social for a free 30-day trial and start sending emojis with ease today! Emojis aren’t limited to text messages anymore. Today, emojis are everywhere. They’re popping up in movies, marketing campaigns, Halloween costumes and even as bank passwords. 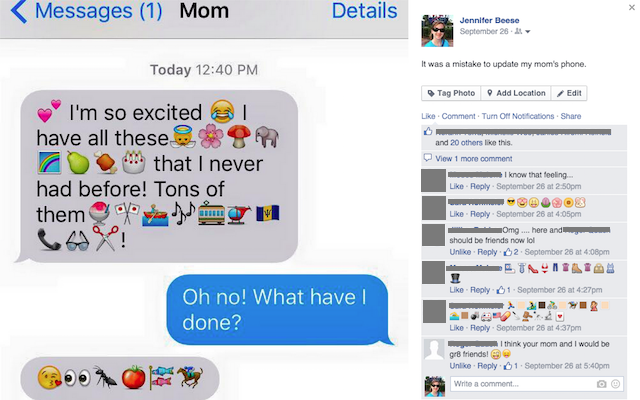 Millennials grew up with online messaging platforms, so for this age group, emojis are like a second language. A recent survey from Emogi discovered 75% of men and 84% of women respondents believe emojis are a better way to express their emotions than words. According to Professor Vyv Evans of Bangor University, emoji is now the fastest growing language in the UK, evolving faster than ancient forms of communication with quicker adoption rates and speed of evolution. “As a visual language emoji has already far eclipsed hieroglyphics, its ancient Egyptian precursor which took centuries to develop,” said Evans. And it’s not just millennials using emojis. Four in five 18 to 65 year olds use emojis on a regular basis. 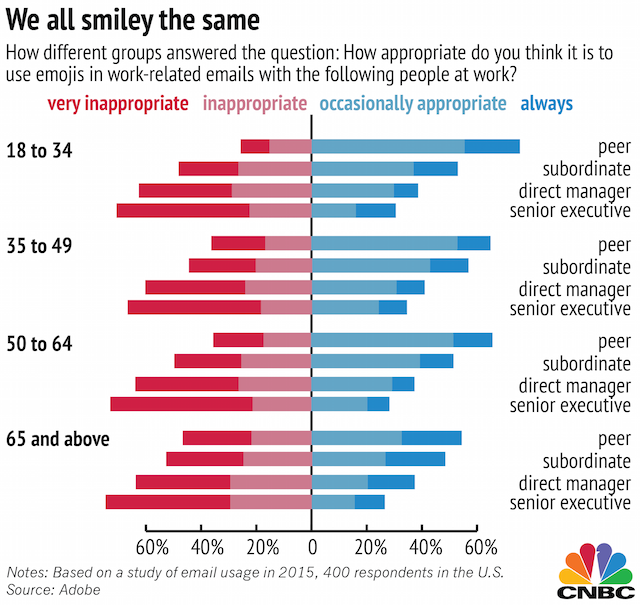 In fact, according to data from a survey by Adobe, people over 65 are more likely than any other age group to say it’s “always appropriate” to send emojis to a direct manager, peer or subordinate. Scientists discovered that when we look at a smiley face, the same parts of the brain are activated as when we look at a real human face. Emojis actually change our mood, and we might even alter our expressions to match the emotion of the emoji character. In 2014, the White House Council of Economic Advisors released a report about the status of millennials. It discussed topics important to millennials, such as education, debt and healthcare rates. But how many 18 to 34 year olds do you know who will actually sit down to read a 40-plus page report? 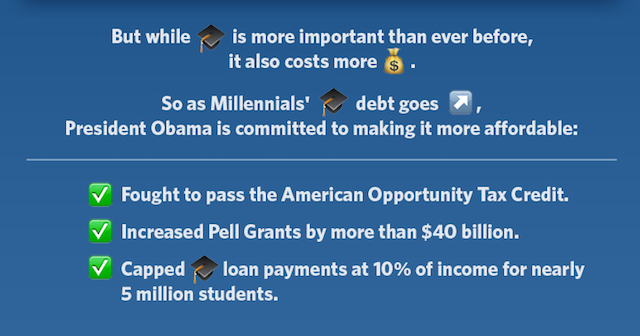 The White House wasn’t very optimistic either, which is why it released an accompanying infographic complete with emojis. The infographic is a perfect example of how President Obama is using digital technologies to reach younger demographics. When you think of investment banking, you don’t usually associate it with flexibility or fun, but that’s exactly the side of Goldman Sachs we saw in this March 2015 Tweet. The company, which analyzed the spending habits of millennials, condensed its findings into a series of 22 emojis on Twitter. Now it’s not known whether everyone understood Goldman Sachs’ message, but at the very least it got people to click on the accompanying link. What better way to appeal to younger consumers than by launching a campaign designed around emojis. 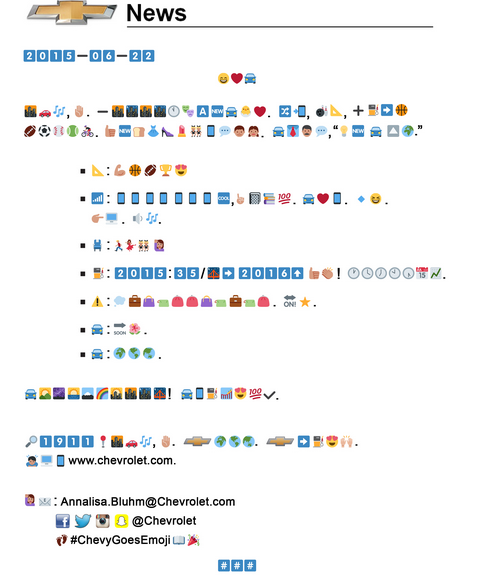 This past June, Chevrolet issued a press release entirely in emojis and challenged audiences around the world to decipher its meaning. The translation was released a day later explaining that it was meant to announced the 2016 Chevy Cruze. While some praised the car manufacturer for the clever announcement, others criticized it for being overly gimmicky. Regardless of which side you’re on, the campaign created plenty of media buzz. Ordering a pizza isn’t very difficult, but apparently there’s still room for improvement. Domino’s Pizza now lets customers place an order simply by Tweeting (or texting) the pizza slice emoji. Set up an Easy Order and register their Twitter handle, topping preferences and payment information. Tweet the pizza emoji at Domino’s. Someone from Domino’s will then contact the customer via a Direct Message to confirm the order. Apparently this can be done using a thumbs up emoji. One drawback is in order to use Easy Order, you must first place an order using the company’s online platform. So before you start Tweeting pizza emojis like they’re going out of style, make sure you’re all set up to ensure the smoothest experience possible. General Electric isn’t shy about testing out new technologies, especially as part of its content marketing strategy. Following the launch of its Emoji Table of Experiments, the company teamed up with Bill Nye to run a pop-up lab, which exchanged emojis sent from Snapchat fans for fun science experiments. For example, Snapping the rocket emoji to GE will return a 15-second video of a vinegar rocket exploding. If you Snap a broken heart emoji, you’ll receive the “Bubble Balloon” experiment where a heart-shaped balloon is inflated by the reaction between vinegar and baking soda. Emoji Science has since been turned into a Web series in which Bill Nye explains basic science concepts using emojis. Emojis serve many purposes. They can express excitement or sadness, order a pizza or tell a story. In PETA’s case, emojis can also inspire action. In 2014, the animal rights organization released a video called Cruelty Beyond Words, which incorporated emojis and asked viewers to text a heart emoji to prevent animal cruelty. Considering the playful nature of emojis, the video is rather powerful—even without a Sarah McLachlan tune playing in the background. There’s little ground for viewers to mistake the purpose of this ad and in the right context, emojis can inspire and drive results. Sometimes emojis don’t have to serve a purpose at all. Last year, Bud Light Tweeted its own version of the American flag to wish followers a happy Fourth of July. Without a single word, other than the #4thofJuly hashtag in the Tweet, Bud Light was still able to garner more than 147,100 Retweets and 110,600 Favorites. In terms of reach, this just goes to show how powerful a well-timed Tweet can be. To celebrate the first day of Spring, Miracle-Gro launched a #springmoji garden. Designed to get consumers excited about planting, the #springmoji garden was the biggest crowdsourced community garden built entirely from plant and flower emojis. 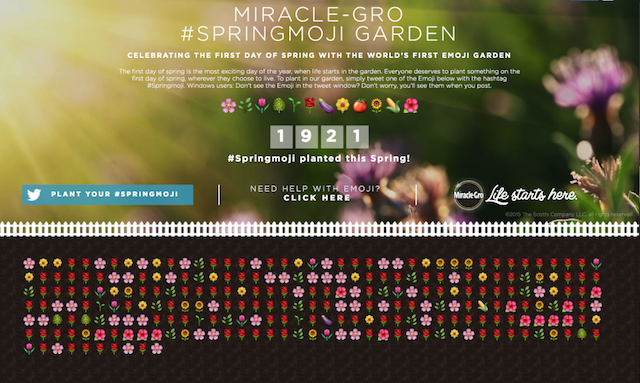 Every time one of the 12 spring garden emojis was Tweeted using the hashtag #springmoji, Miracle-Gro “planted” one in its digital garden. 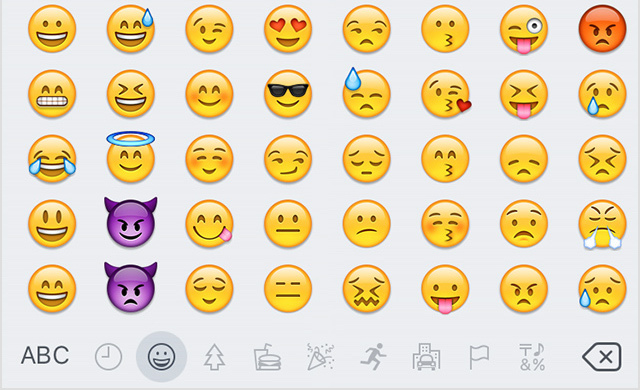 As of April 2015, nearly 1.6 million emojis had been planted. While you’re eager to use the latest technology and trends to reach your audience, you first want to ensure that your audience is there. Start slow and test everything. Emojis probably aren’t going away any time soon, but emoji marketing might not be for everyone. If emoji marketing is something that appeals to your target audience, don’t include them just for the sake of hopping on the bandwagon. “Everyone is doing it” isn’t a good reason to integrate something into a social media marketing strategy. Think about what your audience cares about and then try to relate to them in a more human way. If you can use emojis to tap into emotions, great! But don’t toss emojis into every piece of content just to have them there.